Feelings: Ever since I heard about the obanzai restaurant Hibino on a Japanese TV show, I have been eagerly waiting to try this place. Coming from Osaka, I enjoy not only stereotypically greasy Osakan street food and ramen but I also appreciate more delicate Kyoto home style cuisine called obanzai, which is known for heavy inclusion of vegetables and tofu. As we entered the restaurant, I noticed that the place is run by all Japanese people, and I could sense the Kyoto style zen minimalist decor. We were welcomed by a dashing hostess, and RB could sense my highest expectation and excitement at this point. Obanzai dishes, which change daily, were quite reasonable at only $4 for the Japanese style tapas, and there were many tofu options from $4- $9. I decided to order my childhood favorites, shiraae ($4, Seasonal Vegetables served with Tofu Sauce) and agedashi tofu ($6, Deep-fried Tofu, Shishito Pepper, Shiitake Mushroom with Dashi Broth). My late grandmother used to make these two tofu dishes for me ever since I had declared my resentment towards meat at age 5. I have not yet re-encountered that flavor she used to make after she passed away. They had their own interesting take on shiraae recipe. They made the tofu sauce into a dipping sauce instead of mixing it all together, which was a brilliant twist since I could taste how fresh the vegetables were. The tofu sauce was divine, and the flavor resembled my grandmother's. 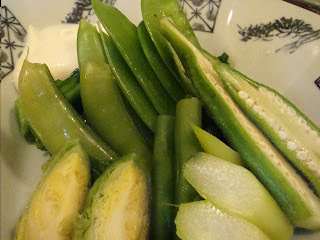 The creaminess and nuttiness of tofu did not overpower the fresh Kyoto vegetables but harmonized the overall flavor and texture. The agedashi tofu was superb. It was actually better than my grandmother's (I'm sorry! 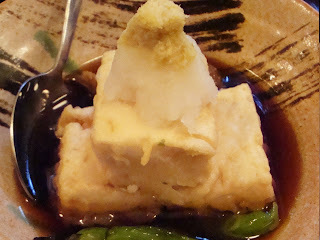 ), and it was one of the best dishes I have ever had, including many tofu restaurants in Kyoto. The tofu was incredibly smooth, and it melted gently in my mouth as I chewed. The shiitake mushrooms and the breaded outer layer of the tofu soaked up all the dashi soup. As I took every bite, the soup spread in my mouth, leaving with many notes of complex dashi flavor. I was sad to see the bottom of the bowl. RB ordered age takoyaki (deep fried takoyaki), which we had never tried before. As an Osakan traditionalist, I cannot openly admit that I enjoyed their take on this Osaka's most famous street food, but I secretly loved it. It was light and crispy outside, and all the good flavor of takoyaki was present inside. 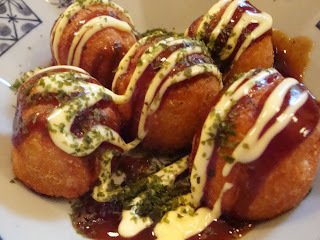 If you don't enjoy takoyaki due to its gooey texture, you will like their version. RB actually said it was better than regular takoyaki. Alas, he will not be allowed to enter his foot on the street of Osaka again! For entree, RB had his eyes and heart on beef kakuni (Braised Short Rib in Sweet Soy Broth with Daikon and Tokyo Scallion). 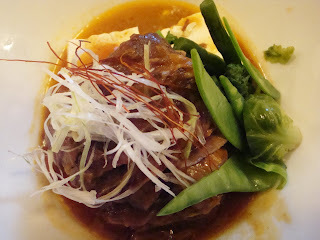 He said he prefered Chiyono's kakuni more, which comes on the bone, but he loved the tofu that came with the beef. It absorbed all the flavor and became the centerpiece of the dish. 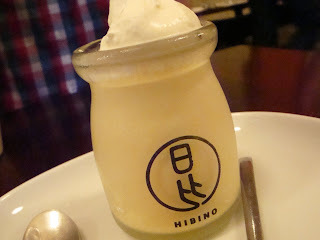 We finished the amazing dinner with airy little heaven of soymilk pudding. This was by far the best meal I have had for a while. At $45, this is an exceptionally great deal. 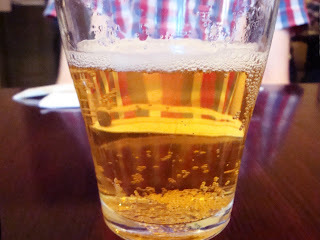 If you try this little gem, please think outside of sushi and try obanzai and tofu dishes. They do have sushi and meat dishes, but this is one of the rare obanzai spots in NYC. I assure you this will give you a taste of Kyoto life. I love Hibino! Especially the fresh made tofu. their tofu is really good!! BK has everything.